Some random items from my first week+ in New Zealand. Ferns They're everywhere! 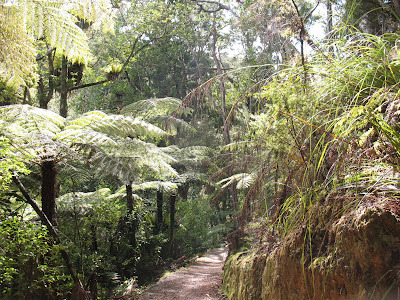 The place is just covered with ferns. Free-range livestock I haven't had a steak yet to prove whether my theory is true, but I bet the cows here are delicious, as they just roam free and eat grass all day. Same with sheep. And they're EVERYWHERE. I think I've seen more cows in the last five days than in my entire life. 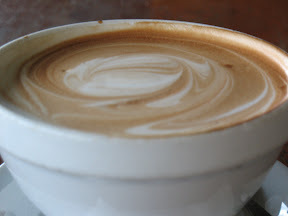 Coffee Lattes are a particular favorite here. They come in big bowls and are loaded with milk. Dorms Sharing a bedroom with 5 other people is not as hard as the unexperienced might think. Geography No one has any idea where Nebraska is. Demographics I can count the Americans I've met so far on one hand. Many Canadians. Tons of Brits (mostly English) and Germans. Several Japanese, Aussies and Irish. And at least one: Pole, Hong Konger, Romanian, Brasilian, Italian, Chilean, Dutch, Malaysian, countless others. The diversity is exciting. And the not so good It's rained a lot in the last 24 hours, and I have a pretty good cold going on here. I feel sorry for my roommates as I sniff, hack and cough through the night. Be sure to check out my photo album for pictures I haven't posted to the blog. Some good ones there. I'm back in Auckland for the night. Next stop: Rotorua! Famous for its hot springs, sulfuric odor, maori culture and plenty of ways to harm oneself. I'm quite jealous of our current lifestyle as I prep for my first exam. Damn you and damn your travelin'! Anyways, I think I got a text from you a few days ago, to which I responded, and then never heard back again. Glad you're still alive!! !